Join us for the Villapesusukat KAL! This combo package includes the Blue Shades: the medium grayish blue Sarastus (Dawn) is combined with a mix of Muste (Ink), and Kosmos (Cosmos). You will receive one (1) skein in each color: a 100 g (3½ oz) skein of Sarastus and one (1) miniskein of the contrasting colors, weighing 25 g (0.88 oz) each. The yarn chosen for this KAL is our trusty superwash sock yarn Väinämöinen, and during the KAL, you will receive instructions for working a pair of socks in these matching, beautiful colors. 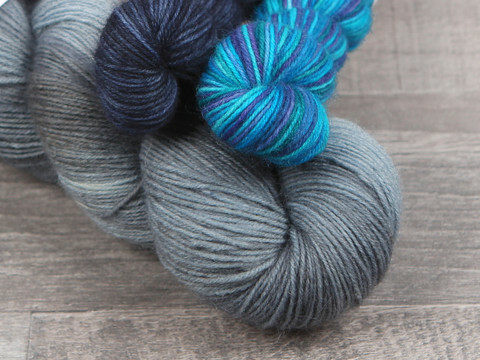 These colors have been specially hand-picked for the Villapesusukat KAL! Please note that all packages will be dyed to order and shipped by September 7th in time for the pattern and the KAL start. Finnish Customers: Please place your order by September 5th in order to receive your yarns in time for KAL start on September 14th. 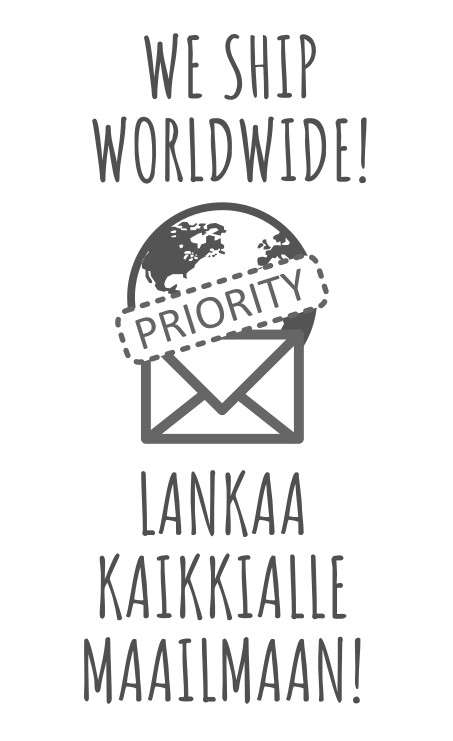 Customers outside of Finland: Your yarns will ship out on September 7th. Delivery times will vary. 100 g / approx. 400 m (3 ½ oz / approx. 440 yds). Recommended needle size 2-2,5 mm (US #0 to 1½). Recommended stitch gauge in stockinette stitch: 26-32 s / 10 cm (6,5 to 8 stitches per inch).